We Log Energy Pty Ltd, a Victron Dealer in Australia, supply, and support the Victron Quattro Inverter Charger in Australia and Tasmania, for the following reasons. The Quattro Inverter Charger is reliable, efficient, produces a quality pure sine wave and can be used in many different places. The Quattro Inverter Charger, has a pure sine wave output, it will not damage your appliances. A Victron Quattro Inverter Charger can be installed in your home, shed, business, Mobile Home, RV, boat or Yacht. 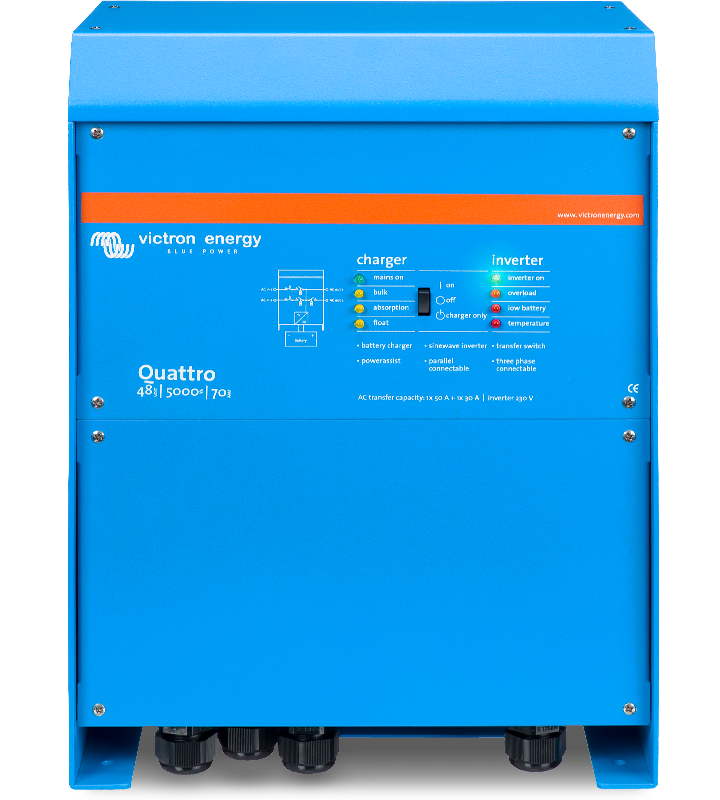 Victron Quattro Inverters operates Off Grid (Stand Alone Power). The Quattro is also a battery charger, connecting your generator to the AC input of the Victron Quattro will charge your connected battery or battery bank. We design and install Off Grid Solar in Queensland, our Off Grid Solar Systems are affordable and reliable. We use Victron Quattro Inverter Chargers and BYD Lithium batteries with a 10 year warranty, in our Off Grid Solar Systems. This is very useful, a generator and a Grid Supply (shore power) can be connected to the AC inputs. Essential and non essential loads can be connected to the two outputs. Non Essential loads are automatically disconnected when there is no Grid Supply available. The Quattro inverter is good a starting those difficult loads, such as compressors, electric motors and water pressure pumps. A Victron Quattro Inverter can be used as an UPS because it has a very fast switching time. Connected loads, such as computers will continue to operate, without interruption, when the Quattro switches between the external AC input and the Inverter. The Victron Quattro Inverter Charger can regulate the amount of current that it draws on the AC input, when set correctly. This prevents overloading your generator or external AC inputs to the Quattro. Victron Quattro : Versatile, available in many different sizes and configurations. The Quattro Inverter Charger is available in models from 5kVA to 15kVA. The Quattro is also compatible with Lithium batteries as well as Lead Acid and many others. The Quattro’s can be connected together to increase output power, or provide 3 phase power. We have installed many Victron Quattro Inverter Chargers, they are very reliable and have a 5 year warranty. Victron Energy, a European (Dutch) company, established in 1975, is a leader in the application of renewable energy systems. The Victron R&D team are constantly improving the Quattro Inverter Charger. The Victron Quattro can be monitored locally with a Color Control Gx, or a Venus GX and a computer/Tablet or Smart Phone. The Quattro Inverter Charger is robust and well supported, by Victron Dealers, including Log Energy Pty Ltd, in Australia. The Victron Quattro Inverter has a 5 year warranty. Victron Quattro : Quattro Inverter Charger Installation Guide, Quattro Specifications, Quattro Datasheet, Quattro Wiring Diagrams, Quattro Photos, Quattro Dimensions and the Quattro manual can be found here.